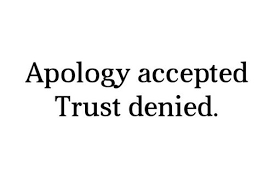 Sorry is a word that is so overused and terribly misunderstood. It is a word at times that we long to hear from certain people, often because we think it will make everything better. Having someone say they are sorry, does it really make all the problems go away? It’s a nice word for instance if a person accidentally bumps into you, but using the word sorry to mask a behaviour that has deeply hurt you is a very different story. My theory is that everything is a gift granted to us by the people that we have chosen to be a part of this life experience. When one of those humans does something to make us hurt inside, they are actually living up to what we expected of them, to poke at where we need to heal at a soul level. Them saying sorry isn’t going to fix what is broken inside of us, saying sorry in all honesty isn’t the cure for what is internally ailing you. Only we can get to the healing where our ego has caused us to suffer, it is entirely our responsibility, no one else’s. Saying sorry means there is regret and remorse for something said or something done (or so it goes), but are we not to believe that when someone shows us who they are, we should believe them, and we should perhaps pay closer attention to their behaviours, for the sole purpose our inner healing. Life doesn’t have to be so complicated, we humans have a tendency to make it difficult on so many levels. I understand that sorry is a relief to hear when we feel we should and need to hear it, but what we tend to grossly misunderstand it that it doesn’t fix a single thing. Perhaps instead of spending so much of your energy expecting the other person to repentant, use that energy to become more aware of why you felt so emotional about what was said or done to you, this is energy better spent. We shouldn’t expect other people to make everything better, nor should we expect other people to make us happy, if everyone took responsibility for themselves and owned up to their ‘stuff’, we could really get to some beautiful healing on this planet, for the good of mankind and the animal kingdom too. If sorry is a word that means a lot to you, ask yourself why? It might be a good place for you to start with your healing journey.